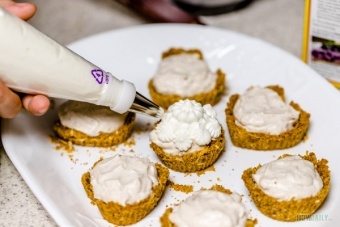 Creamy sweet n sour banana pie in a cup cake size graham crackers encasing, this dessert is the best to serve after your Thanksgiving or holiday dinner. Bake them for your party today with these simple steps. If you are using sheets cracker, throw them in a food processor and pulverize until they're all finely crumbs. 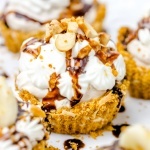 In a mixing bowl, combine graham cracker crumbs with sugar and toasted coconut. Stir well to mix. Melt butter and use a fork to whip and mix well with the above cracker mixture. 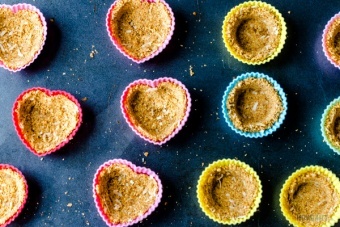 Divide and spoon mixture into cup cake mold or muffin pan. Press and firmly pack crumbs to pans bottom & side. Bake them in oven for 7-8 minutes at 300 F.
Once done, let cool at room temperature completely. Then carefully remove them from mold/liner cup/pan. Evenly slice banana. Pick out enough slices for divider and topping, squeeze some lemon juice over them to keep from turning dark. Add the rest of banana, heavy cream, some salt and couple lemon drops to blender or food processor. Pulse and blend away. 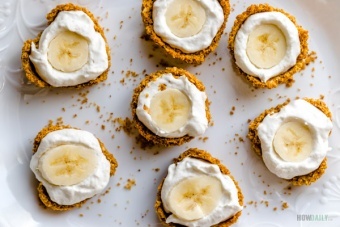 Stir the banana cream mixture together with Greek yogurt. Mix them good and chill in fridge for an hour or 2. Keep your whipping cream, Greek yogurt, mixing bowl and whisk in fridge to chill until almost before serving. Pour whipping cream into mixing bowl and whip until peaks. Add sugar gradually as you whipped. When peaked, add Greek yogurt and stir to mix. For each graham cup, spoon in the banana cream mixture to about half of cup. Add a slice of banana as divider. Then spoon in some more banana cream to fill cup. Top with whipping cream-yogurt and an extra banana slice on top. Drizzle some chocolate or caramel sauce and sprinkle some nuts. Serve away!